Fevers, coughs, nebulizers and the flu – oh my! As previously mentioned we had several doctor visits on Monday. This is how NHL looked on Monday before going to the doctor. He was exhausted from being up almost all night (two evenings in a row) with a horrible barking, croupy cough that would not go away. Things were worse Monday night. NHL was gasping for air. 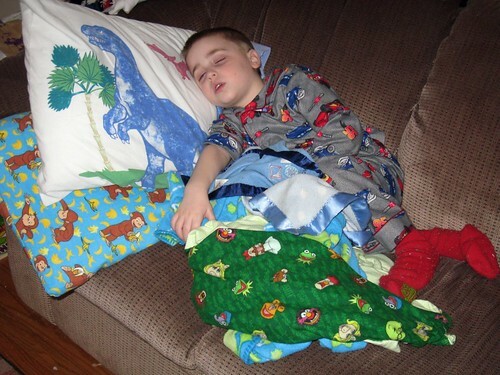 JL went to work and NHL fell asleep on the couch from sheer exhaustion. The poor little guy could not catch a break. Every time he would fall asleep he would wake up coughing that dry barking cough again and again. At about noon he was in tears asking to leave. He said he hurt from the cough. His entire body was shaking and he was gasping for air. I put in a call for the doctor since the breathing was getting so bad and Motrin and Tylenol together were barely keeping his fever under 100 when given together. While waiting for the call back JSL was quarantined to another room with me (not worth much, but it was all I could do). 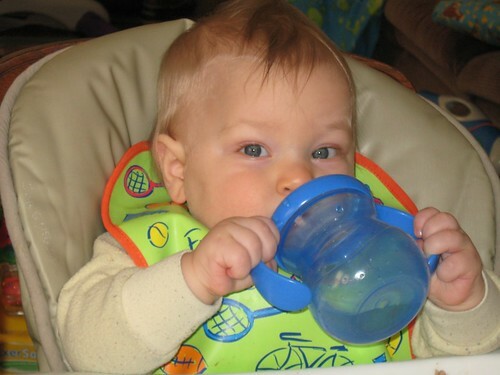 He was having fun playing with his Nubby sippy cup. All of the sudden he started "talking" to me. I was floored. It was not simply play time. . . he was drinking water. I could see him doing the proper sipping motion and see water in his mouth. Wahoo! This was a much needed thing since the baby will NOT take a bottle since he was in the hospital in February. 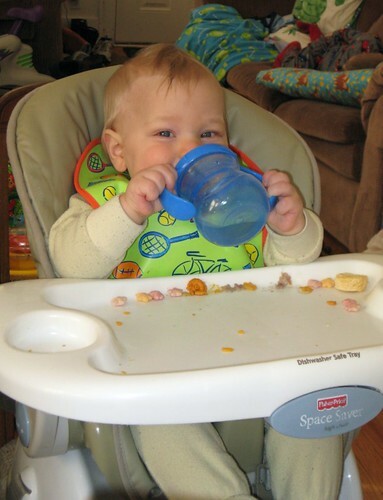 So now he knows that the sippy cup is not only a fun water toy to get soaked with, but also useful to drink! Another milestone during this was JSL saying "cheese" when I fed him a slice of cheese. His words just keep adding up. At about this time the nurse called back. They were going to call in a nebulizer for us to use with NHL along with medications for it. After much "fun" (note the sarcasm) straightening out all of the co-pays, getting a pharmacy that actually had the medication we were all set. At about 3:00 the machine was delivered and Papa brought the medicine soon after. 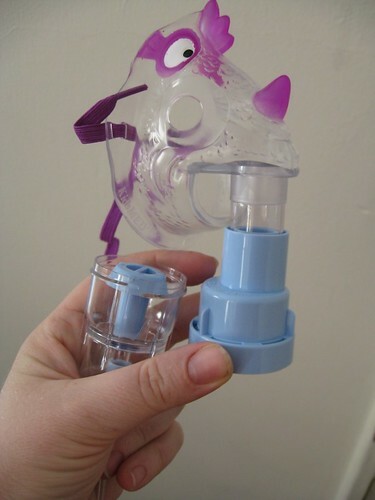 Here is the top of the new handy dandy nebulizer. We have used this for the one medication since Tuesday night (2 times a day) and we have started to notice a difference. The barking cough is much less pronounced. NHL is also able to run around and talk without getting winded. The fever still does not want to back down. However we may have turned the corner. Last night we went without replenishing Motrin and Tylenol during the night. So far with only Motrin we have kept things below 100! 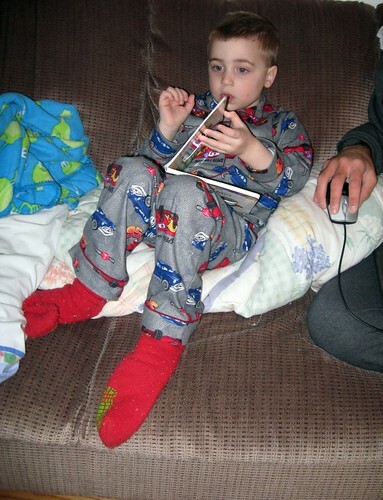 If this stays true then he will be set to go back to school tomorrow – he is SO ready to go back. Oh, and NHL is such a sweet little boy. He shared with Mommy. I have a 100+ degree temperature, aches, sore throat, headache, congestion . . . ick! I am taking Motrin and Mucinex for the congestion since that is all I am able to take when nursing. Now we just have to wait and see if the other boys in the house (JL and JSL) get this nasty flu that seems to originate at the school that NHL goes to. With any luck the rest of the day will fly by and JL will be home so I can go back to BED! Ick. You seriously can not get a break from all of the germs! Sending healthy thoughts your way and praying for warmer weather . . .
Shawna: Thanks! Apparently there is creeping crud going around NHL’s school and kids are dropping like flies. We just happen to be some of those lucky flies. The “fun” thing – we have snow coming overnight. SPRING – what’s that?!? !